Palo Alto’s second largest solar roof system has been installed at the Oshman Family JCC (OFJCC) campus to reduce energy costs and further its green building credentials. Developed through a partnership with THiNKnrg, the 397.5 kW system is also the largest installation of Trinasmart solar panels to date. The OFJCC will celebrate its new solar rooftop with a ribbon cutting on March 18. 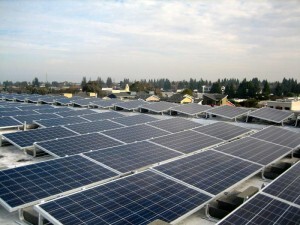 The OFJCC solar array encompasses 1,840 solar panels spread across the rooftops of the 12 buildings of the Taube Koret Campus for Jewish Life (TKCJL), which also includes Moldaw Family Residences for senior living. This solar project was financed by a Power Purchase Agreement (PPA), which required no capital cost to the OFJCC and utilized all available incentives. Conergy, a leading global solar photovoltaic downstream company, along with its owner Kawa Capital Management, structured the PPA to supply the OFJCC with renewable energy at less than half the current energy rate. The campus is expected to save $26,000 in the first year and an estimated $1.5 million in energy savings over the 20-year contract. The solar roof system will supply approximately 20 percent of the OFJCC’s energy needs. The OFJCC solar installation is expected to generate 616,920 kilowatt-hours of electricity and reduce the TKCJL’s carbon footprint by approximately over 9,500 tons of CO2 over the next 20 years, the equivalent of growing over 223,000 tree seedlings or removing 1,814 passenger cars from the road.